We’re finally back after taking almost all of December off homeschooling. As you might remember, we worked through the summer so that we could take an extended winter break because of our planned vacation. We had logged in over 600 hours out of the required 900 hours, so we decided to take the rest of the month off as a reward for the kids working so hard this school year. 🙂 The kids enjoyed their month off, but it was good to get back in the schoolroom. As you might expect, getting a child with autism to get back into the school routine was not an easy task. The first couple days were really rough–a lot of frustration and tears on his part for various reasons. He thought the math and spelling were too hard, the watercolor paints mixed on his paper (he really really hates when paint mixes colors), etc. But, by the middle of the week, he was back into his routine and doing well again. 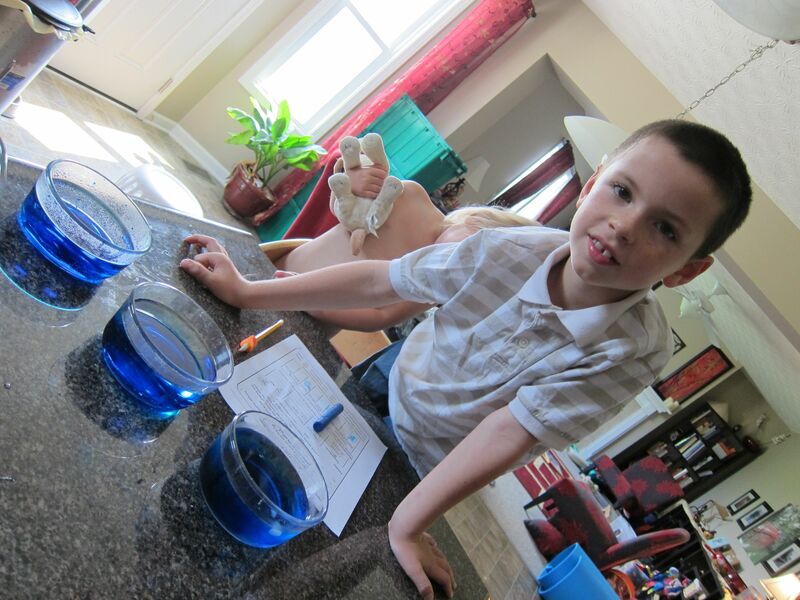 Today, we were finishing up a science project and he kept repeating how he was really loving the science stuff and that homeschooling is great because he gets to do so much science. Here are the pictures of Jedi’s week in review. 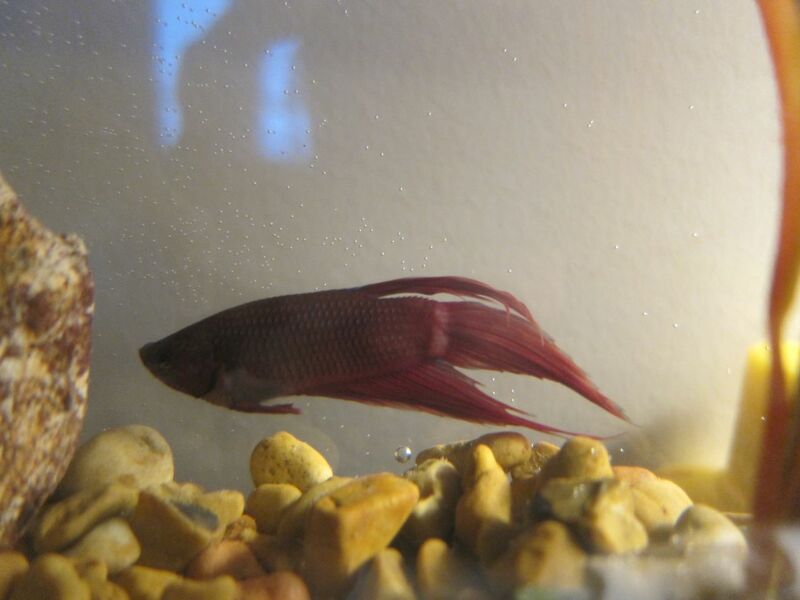 Meet George--Jedi's new betta. 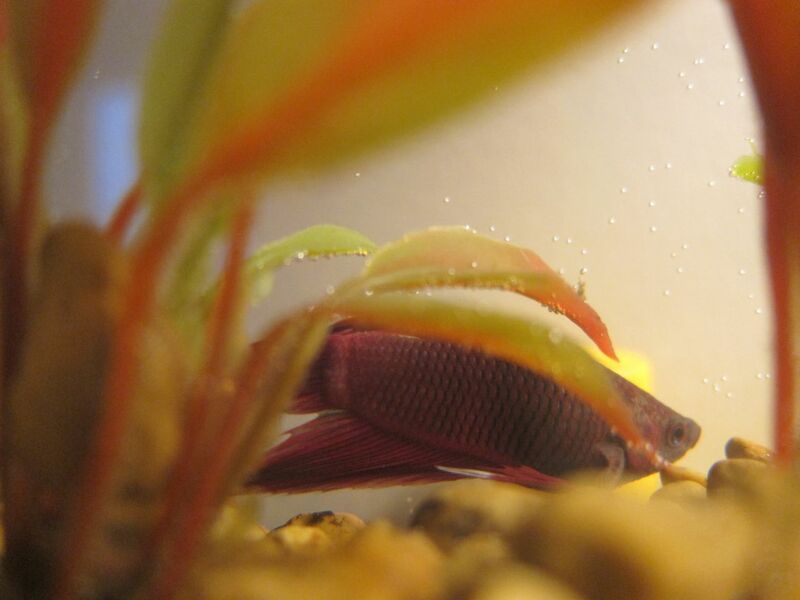 We needed a fish for one of the science lessons, and so George was purchased. 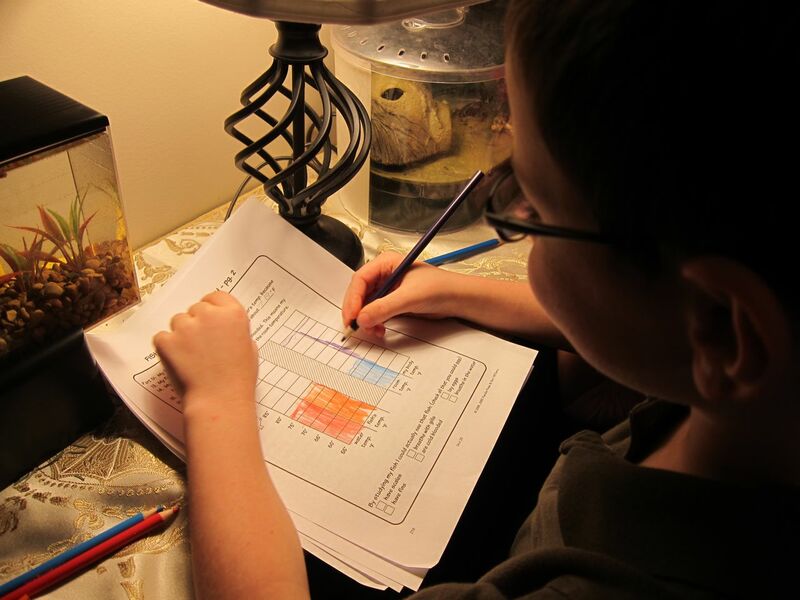 Jedi measuring the difference between body temperature in a cold blooded animal and a warm blooded animal (the fish vs himself). He also weighed George by weighing him in a cup of water, and then weighing the cup of water without a fish. Now that George's role as a science project is over, he currently happily resides on the school shelves by Jedi's fire bellied toads. Finishing his unit on fish, Jedi learned how fish float and swim. He put an empty glass eye dropper into a plastic bottle of water (it floated). The second time, he filled the eye dropper completely with water and put it in the bottle (it sank). The third time, he filled it halfway with water--it only sank a little. Then if you squeeze the bottle, increasing the water pressure inside the dropper, the dropper sinks. This experiment helped simulate the fish's air bladder. This week, we began our two week unit on the United States for World Geography. 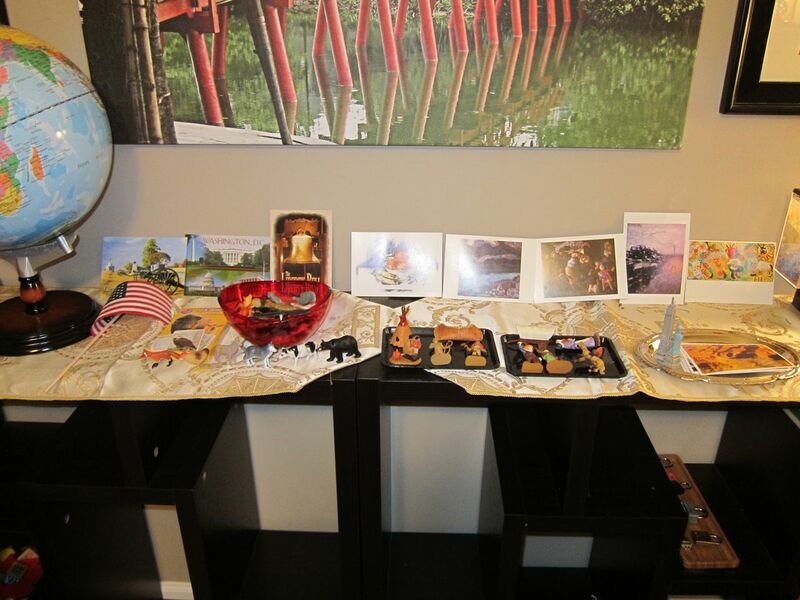 I filled the top of the shelves with various objects that represent America--some art, postcards and flash cards of monuments, Native American figurines, pioneer figurines, cowboy/western figurines, a bowl of American animals, a flag, and a deck of US animals. 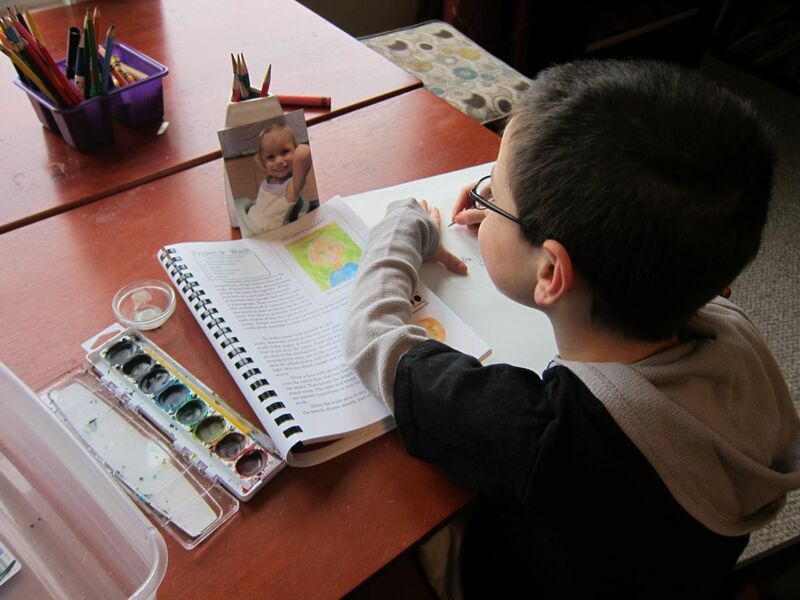 Jedi doing a watercolor portrait of his sister. He was studying Van Gogh, although after his meltdown over mixed paint, we had to do an impromptu lesson on Picasso. 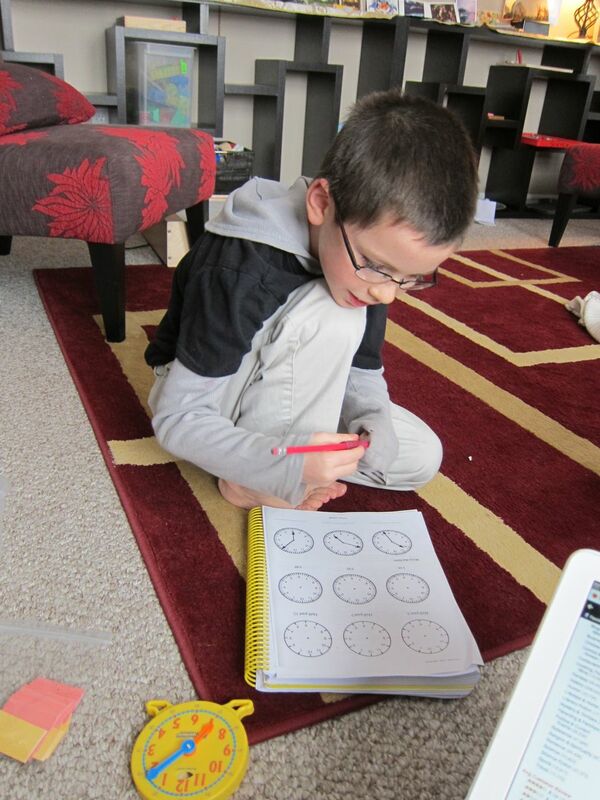 In math, Jedi learned to tell time on a clock to the minute. He did really well with this! Reading about Mount Rushmore. He also watched a short documentary on how Mount Rushmore was made. Surprisingly, he loved the documentary! Jedi also learned about Old Faithful. After reading about it, he watched the live webcam. He was thrilled that 30 minutes into it, the eruption happened! Close-up of his work. Keep in mind that this was the same kid who was testing *2 years* behind in math at the beginning of the school year! 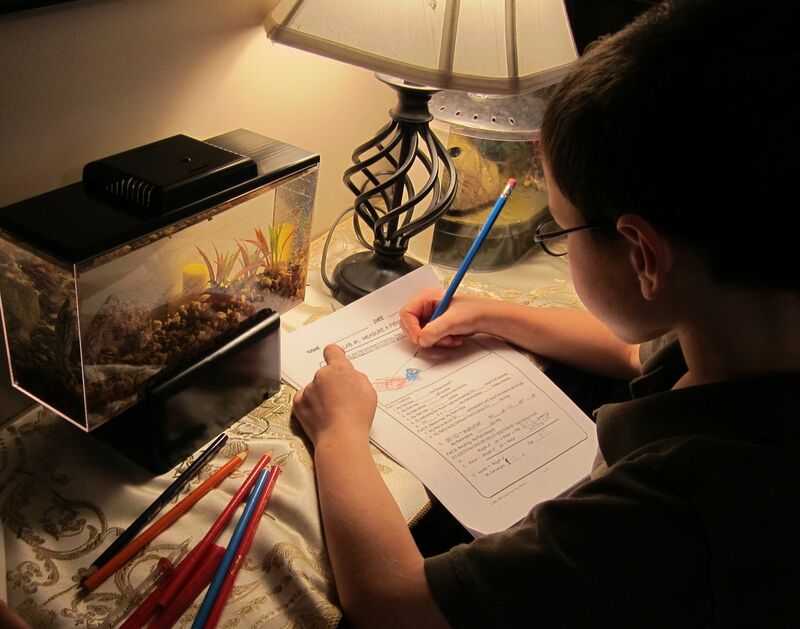 Look how far he's come in just a few months of homeschooling! In Earth Science, Jedi learned about the layers of the Earth. 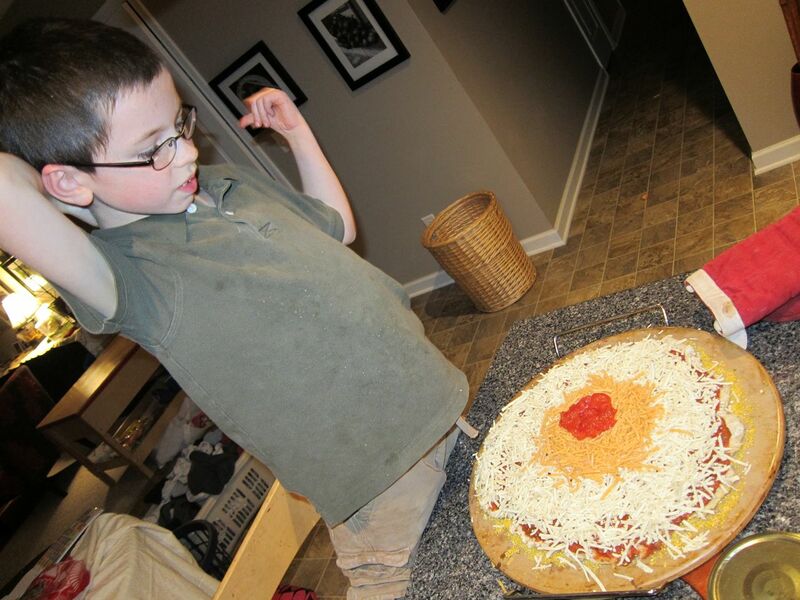 To reinforce the parts, he made us a "cross-section of the Earth" pizza--crust (the pizza crust), mantle (the white area), outer core (yellow area), and inner core (tomatoes). 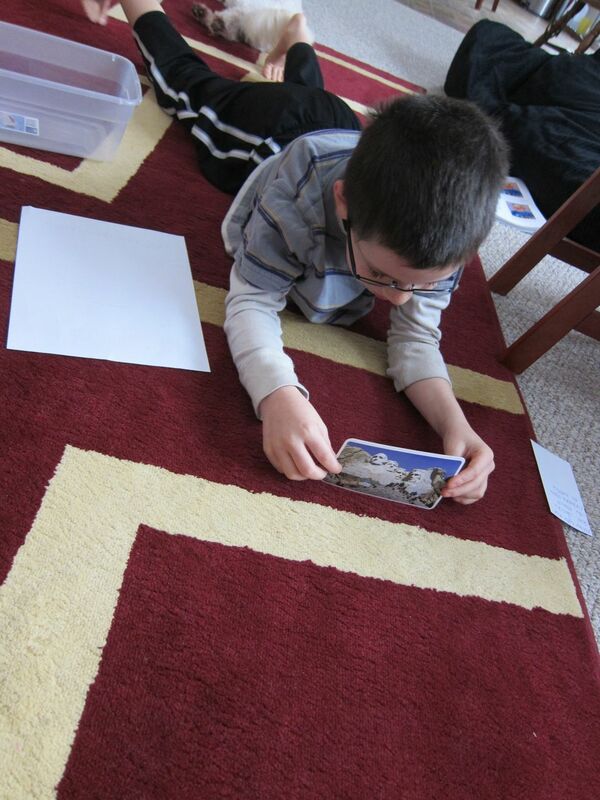 Art: This week, Jedi continued his unit on where art can be found….this time we learned about the art on the walls of pyramids and the floors of palaces. The pyramid unit worked very well because we also were talking about pyramids for history! Since we don’t have pyramids, we had to use long paper. Jedi learned that in Egypt, those commissioned to paint the murals first created a grid out of red paint in order to be able to properly proportion the work. So first, Jedi and I made a red grid on his paper. Then he painted a mural…he chose to create a mural that depicts hiking. The second artform was paintings on the floors of palaces. I don’t have a palace here, nor do I want him painting on my floor ( 😉 ), so we choose a darker colored piece of construction paper and some soft pastels. 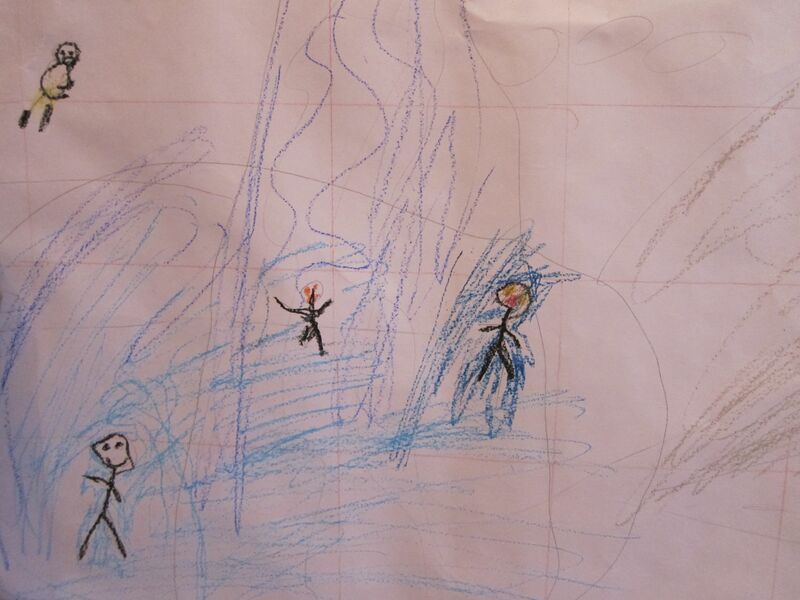 These palace floor paintings were usually of flowers or water, so Jedi chose to draw the lake he went camping and swimming at this summer. A closeup of his mural. He did a mural on hiking. 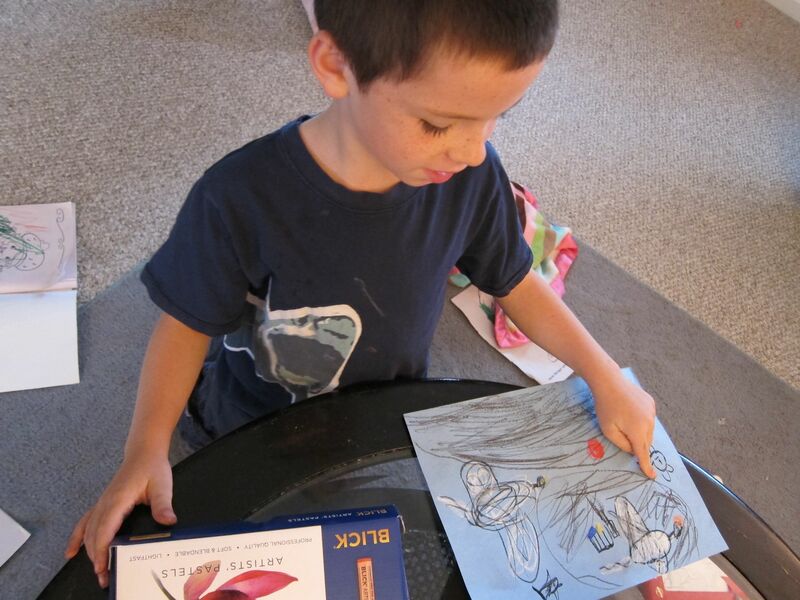 Doing his "floor painting" using dark construction paper and soft pastels. Math: In math, Jedi learned about adding 8 to a number. 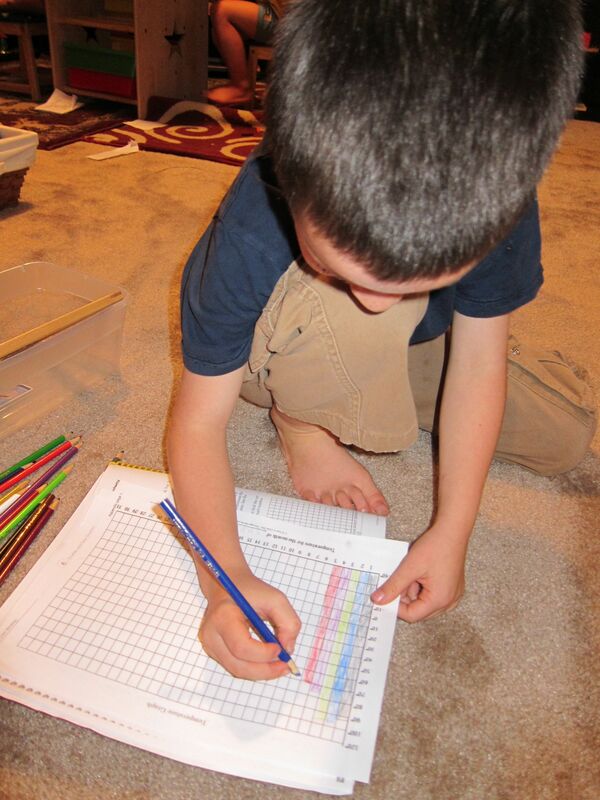 He also began to learn about graphing by graphing the daily temperature. This was also an exercise in estimation since the graph only had the 10’s labeled…Jedi had to learn to estimate the numbers in between that weren’t written on the graph. History: This week, we finished our unit on Ancient Egypt. Jedi learned how pyramids were made, and wanted to make one of his own. 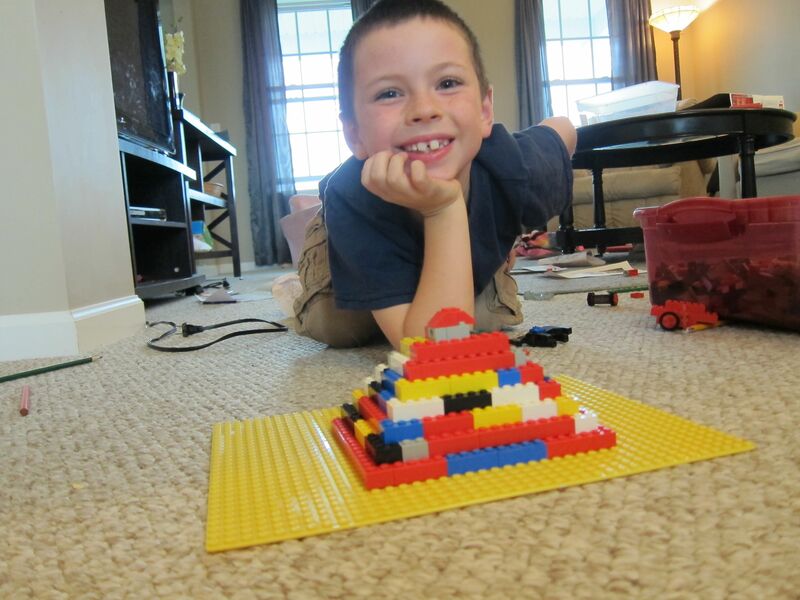 Jedi used legos in order to create his own mini-pyramid. Science: We moved from cnidaria last week to worms this week. 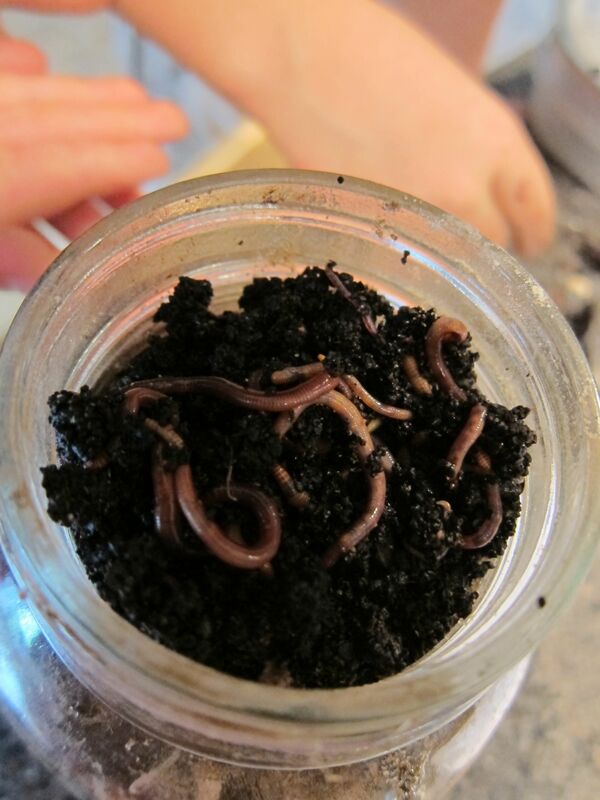 The weather was absolutely awful for going out and having an earthworm hunt, so we had to use our composting red worms from our indoor vermicomposter for most of our work this week. 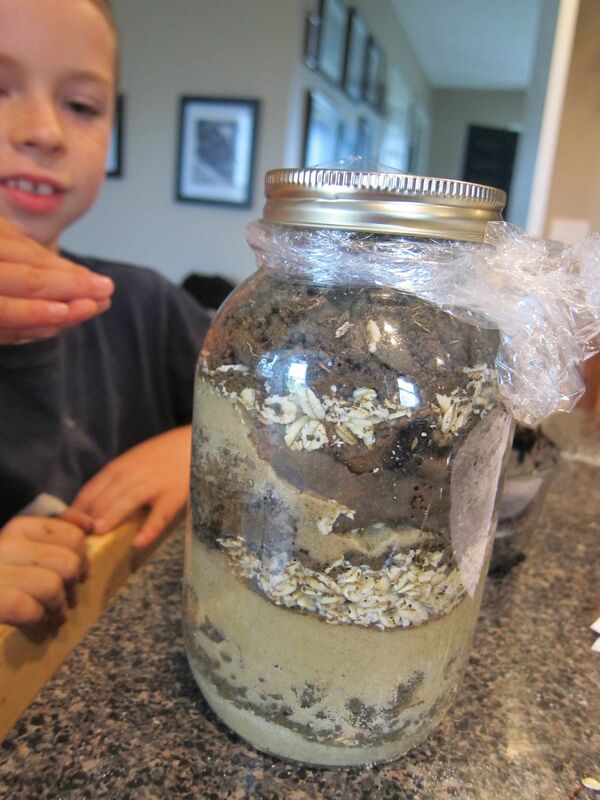 Jedi created his own worm environment in a jar to see how long it would take for the worms to create soil. 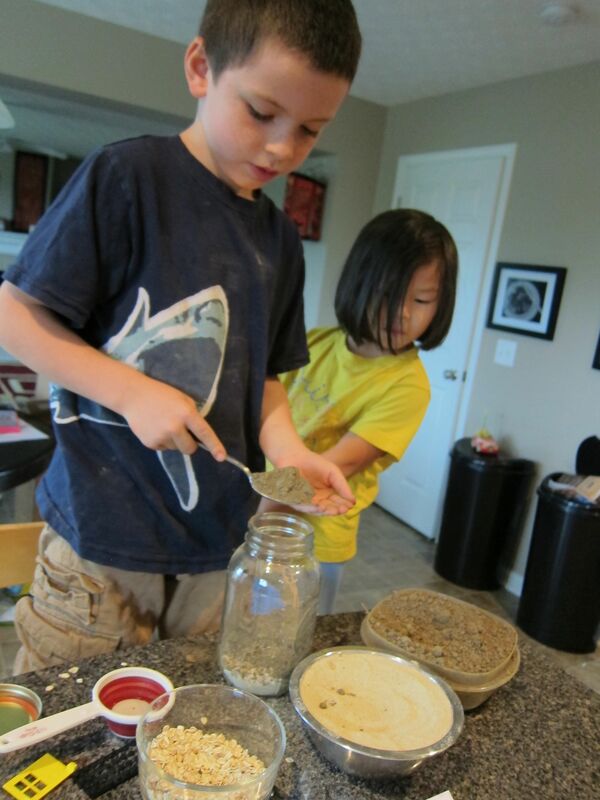 The first layer in our jar was sand, followed by dirt, followed by oatmeal, followed by some scraps of fruit & veggies, followed by more sand, another layer of dirt, and another layer of oatmeal. On top of that, we put some compost from our bin that had worm castings, red worms, and some red worm eggs. Jedi got to see some very very tiny newly born worms, and the shiny eggs. As of this morning (4 days after creating the habitat), the red worms have completely transformed the top two layers into castings! Setting up his composting jar. Worms on top of the composting jar. English/Spelling: This week, we worked on the endings ‘ck’, ‘sk’, ‘k’, and double letters like ‘ss’. Jedi also did daily journal writing. We also started working on more non-fiction reading comprehension because that is an area Jedi is having some trouble in. To go along with the 9/11 theme we were working on this week, I found a passage in our reading comprehension workbook that talked about the Statue of Liberty. 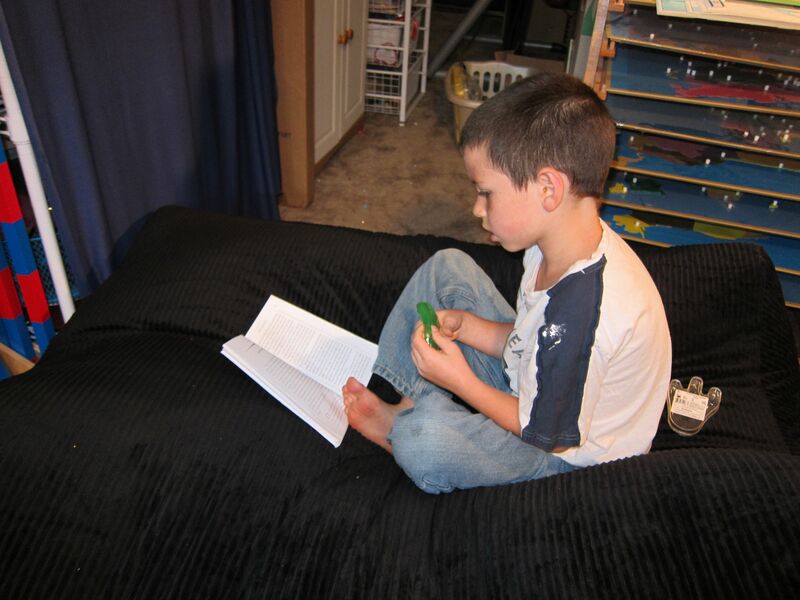 Jedi working on some non-fiction reading comprehension. This passage was on the Statue of Liberty. Misc. 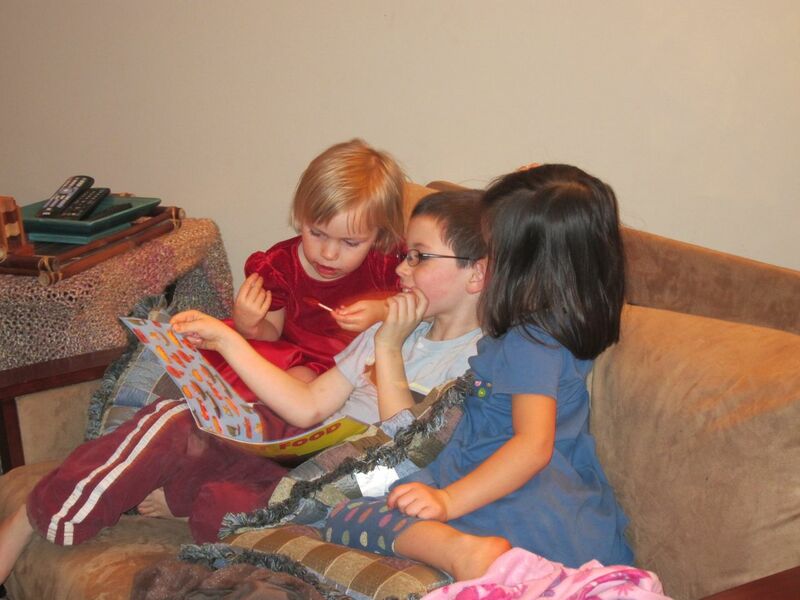 : Also this week, all three kids started their homeschool co-op classes. The kids go once a week to a co-op with a bunch of other area homeschooling families. 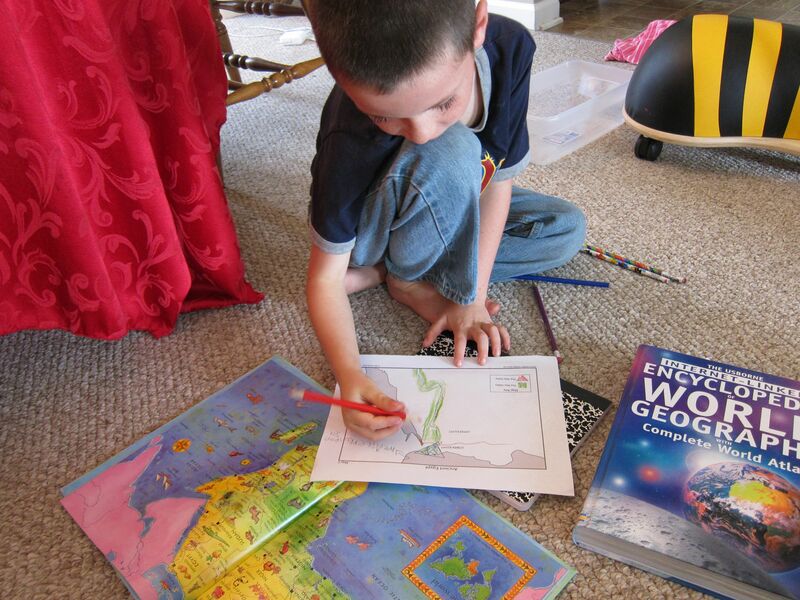 Jedi got to pick his classes from the list of available classes…he chose gym, Flat Stanley (a geography & literature class), Art Around The World (an art & geography class), and Picture Books (literature, art, and creative writing). Bug and Monkey are doing a Geography & Culture class as well as a “mommy and me” music class. Monkey is also doing a “seasonal fun preschool play” class. All three were excited for their first day…especially since they all got to carry backpacks. Apparently that’s a big deal when you’re homeschooled. LOL! Bug, Jedi, & Monkey ready for the first day of homeschool co-op. Art: In art, we are continuing our unit on places where art can be found. This week, the first lesson was on finding art in pottery and dishes. Jedi made a bowl out of clay by using an ancient technique–in ancient times, clay used to be pressed into baskets or dishes and molded to that shape. Jedi used a small bowl as his mold for his clay bowl. In the second lesson, we learned about art in palaces. 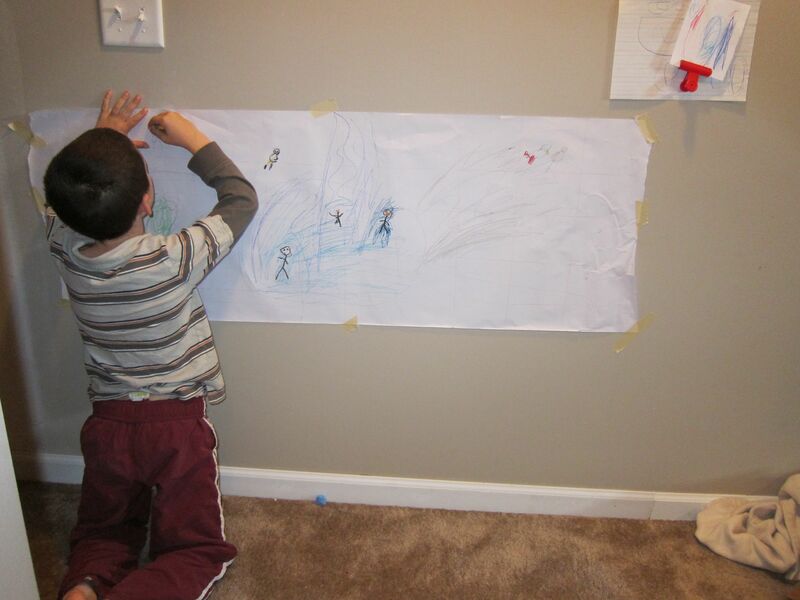 Jedi made a piece of art using the fresco techniques to reflect what he learned about fresco paintings in palaces. Life Science: In life science, Jedi learned about the Cnidaria phylum of animals. First, we learned about the different types of Cnidaria, and then we focused on the sea jelly in order to study the life cycle (egg/sperm to larvae to polyp to medusa). Jedi then created the cnidaria page in his animal kingdom book. Chemistry: In chemistry, we continued our study on the parts of an atom with studying electrons. 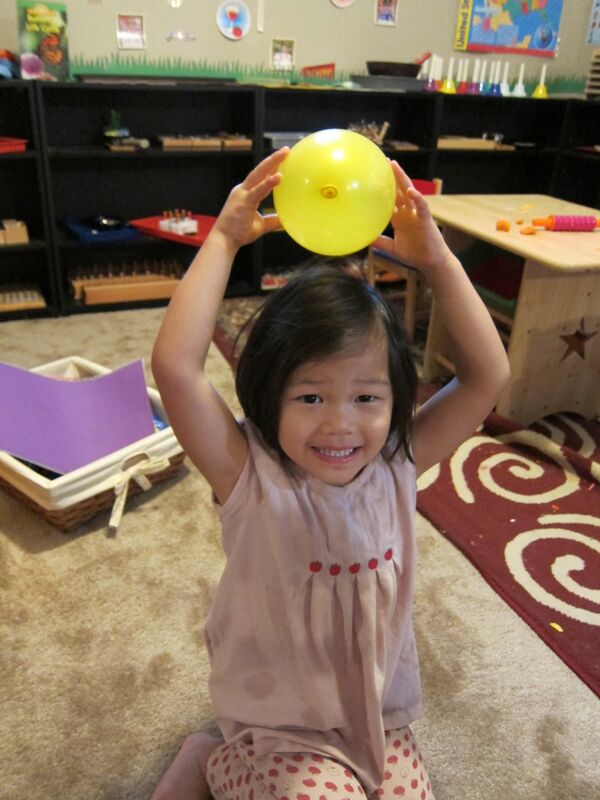 In order to study electrons, we used a balloon to find out what happens when you create friction on the balloon (by rubbing it on the carpet), and then putting the balloon on the wall…or his sister’s head. 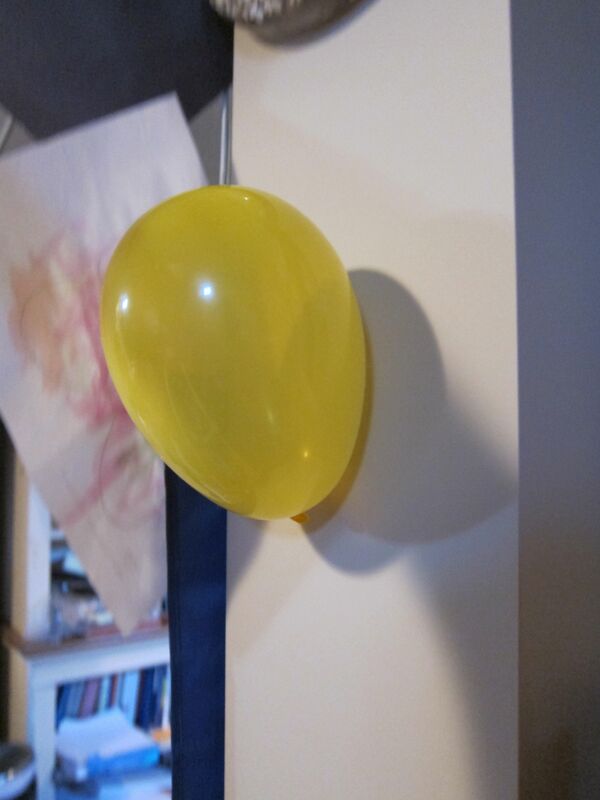 He learned that the electrons from the atoms in the carpet transferred to the balloon, creating a charge. Monkey helping us out since she was the only kid with enough hair to make this work. Apparently you can make a balloon stick to a dog as well! Spelling/Handwriting: In spelling, we continued working on beginning & ending blends, and added in double letters as endings (such as ending in LL). We also worked on when you use a ‘c’ and when you use a ‘k’. 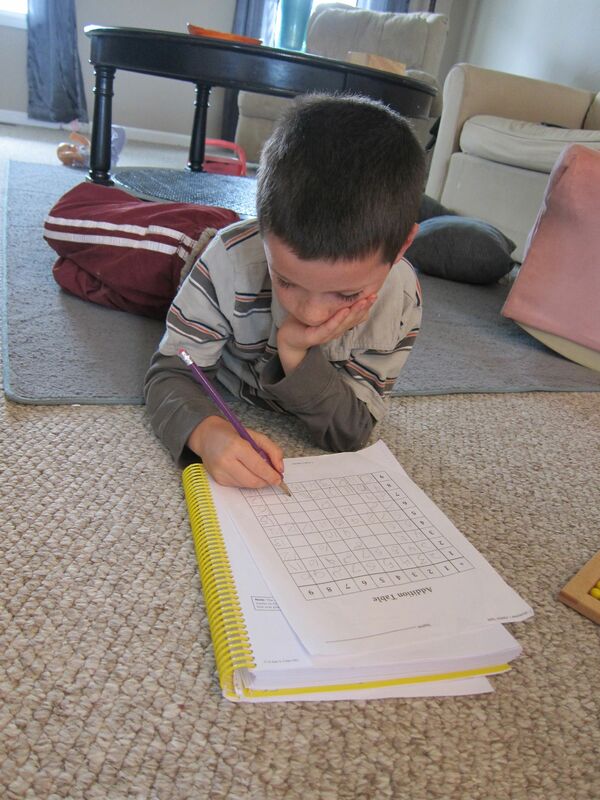 In journaling, he continued to do daily journal prompt exercises in order to work on handwriting and free writing. Math: In math, we worked on adding 3 to a number, and adding 9 to a number. Jedi also did a lot of practice with doing math facts that add up to 10. He still needs to work a big more on these, as he’s really struggling to do the math facts without having to count out each number, but he’s making progress on it! Life Science: This week in life science, we began our unit on animal classification. For the first lesson, he worked on classifying fictional creatures (called Blobonians in the REAL Science Odyssey curriculum). First he classified them based on his own ideas of which creatures belonged together, and then he classified them according to the provided classification chart. The goal was to find the male and female of each ‘species’. Working through the classification chart in order to pair the animals. Chemistry: In Chemistry, we worked on the parts of an atom. He learned about protons, electrons, and neutrons, as well as the nucleus and the space between the electrons and the nucleus. Coloring his "Parts of an Atom" poster. Math: In Math, we continued our work on multiples of 5. We played a game called “Go to the Dump”, which is Rightstart Math’s version of Go Fish. A match consisted of 2 cards where the values added up to 10. We also began work on the addition board, completing the math facts from 1-10 of +1, +2, +5, and then all facts that add up to 10. Working on his addition board. English/Spelling/Phonics : This week, Jedi continued working on beginning & ending blends in words 4-5 letters long. He also worked on adding suffixes to the ends of words (ed, ing, er). Jedi’s having a lot of trouble remembering the rules for adding suffixes, so we are taking extra time working on this. Jedi wrapping his clay body. Art: In the first art lesson of the week, Jedi worked with water color crayons in order to create a picture using red, yellow, and brown. The goal was to make new colors by blending. In the second lesson, Jedi started his unit on places art can be found. This week’s lesson was on cave painting. First, we took a virtual tour of the Lascaux cave (http://www.lascaux.culture.fr/#/en/00.xml). 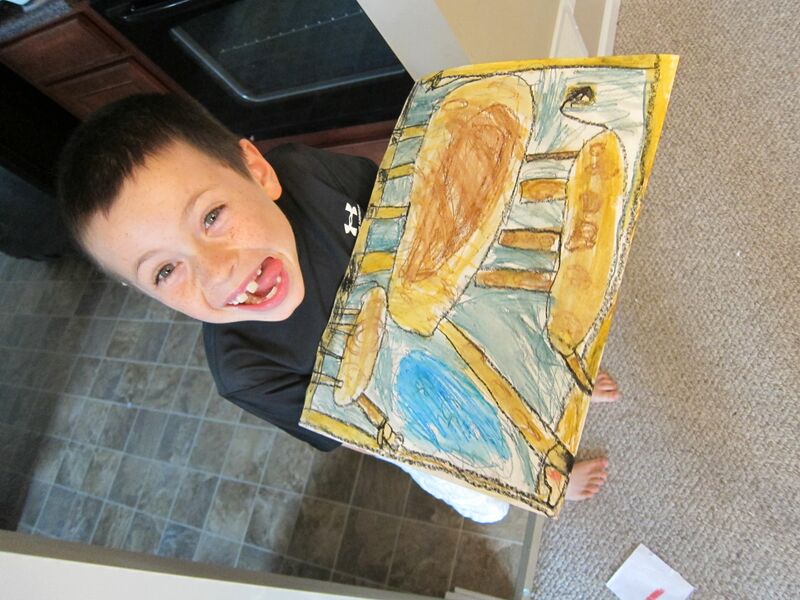 Then, Jedi created his own cave painting out of brown paper and black/red/brown/yellow soft pastels. 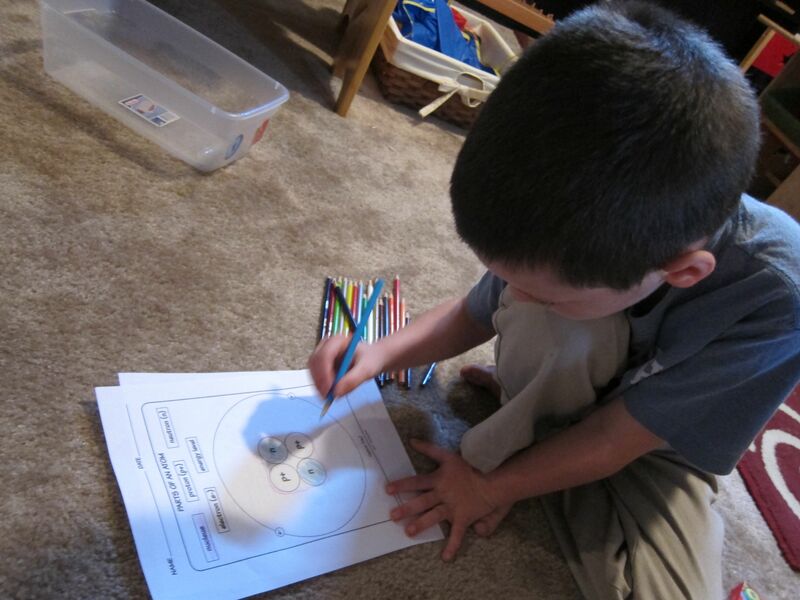 Jedi working on his color blending, with Bug wanting to color along with him. Misc. 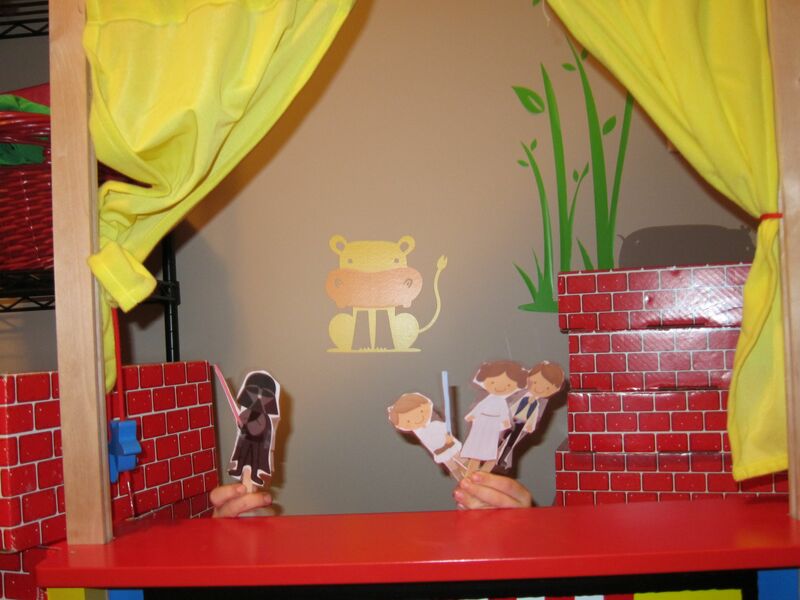 : Jedi finally completed his puppet show writing project and performed it for the family this week! Performing his puppet show, Silly St@r W@rs. We were camping this weekend, so I have a lot of posts to catch up on. The first post is Jedi’s week in review for last week. Art–In art last week, we built upon the lesson on shapes & forms, and began sketching without looking at the paper (and instead, looking at the object you are sketching). This was a good exercise for Jedi…he is usually very perfectionist with his artwork, and this was a good exercise in letting go of that and just following what your eyes see. Life Science—in life science, we talked about genes. The first lesson of the week was on dominant & recessive traits, and which traits he got from each of his parents. Jedi learned that even though he looks like his daddy, he actually shares a lot of the individual traits with me! In the second lesson, he learned that everyone has different fingerprints. 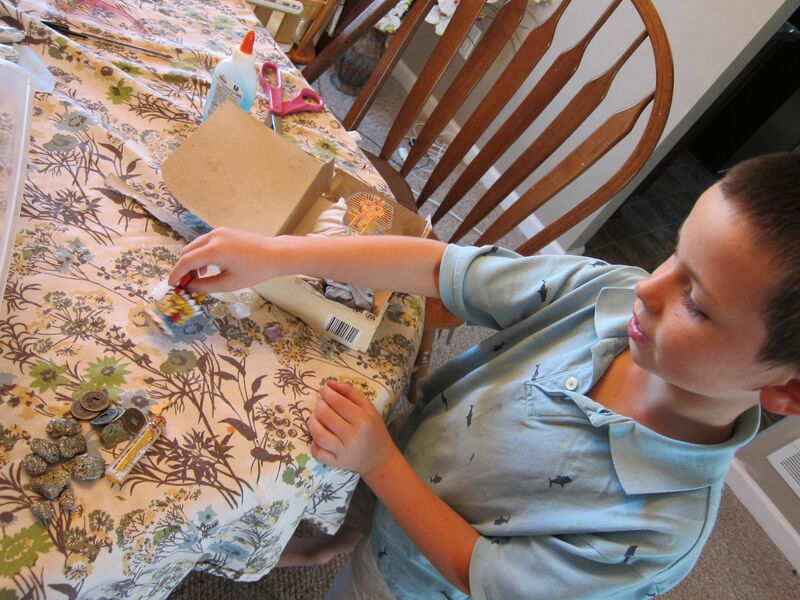 He played forensic detective and investigated fingerprints of family members to see who had the “mystery fingerprint” that was printed on his science paper. Chemistry—in Chemistry, we continued our work with atoms, this time determining whether temperature influences the speed an atom will move. We dropped food coloring in each of three dishes of water (1 boiling hot, 1 room temperature, and 1 ice cold). 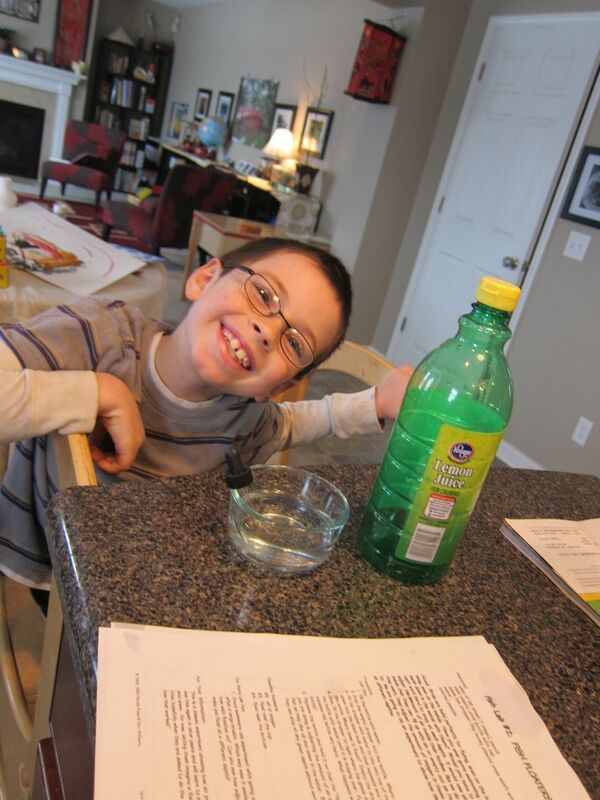 Jedi learned that food coloring atoms travel much faster through boiling hot water, dispersing evenly in under 2 minutes. Math–in math, we continued our work on multiples of 5, 10, and 15. This week, we used coins to see how many ways we could make 10 cents, 15 cents, and 20 cents. We finished the Rightstart transition book (that transitions between 1st grade and 2nd grade), and now we are beginning our actual year’s lessons. 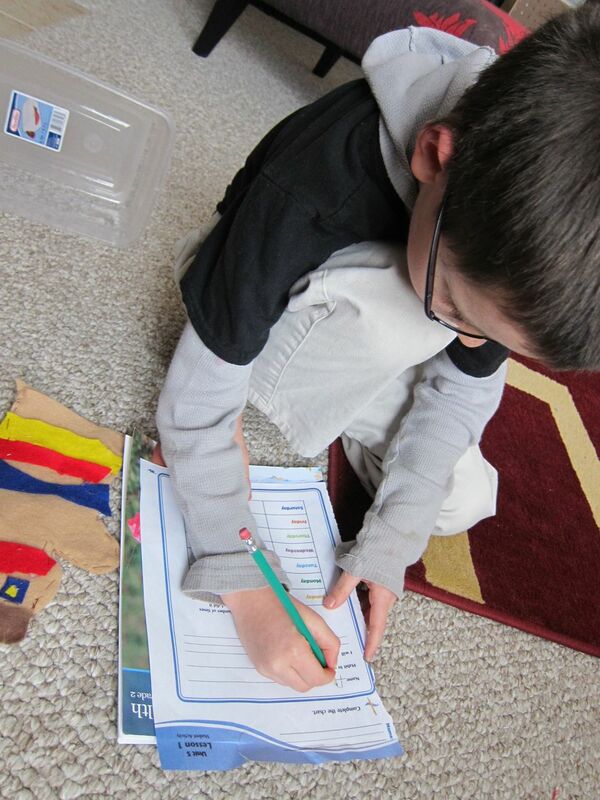 Spelling/English/Handwriting–in Spelling, Jedi finished all of his short vowel sounds and CVC words, and began working in initial and final blends. This was where Jedi finally started having some pretty big difficulties, as he has trouble hearing blends in words. He did just fine with most of the CVC words, but beyond that, he is still having a lot of problems. So, at least now, we know where to start with him (we know he’s at least a year behind in spelling…now we know where the dividing line was between what he knew and what he had fallen behind in). Jedi also continued his journaling every day. In English, he worked a lot on reading comprehension. We’ve learned that he can read very very well, but he often loses the comprehension aspect. He does seem to comprehend fiction far more than non-fiction. Giving him the list of questions ahead of his reading the paragraph seemed to help a lot since it gave him something to focus on. Typing–This is one of Jedi’s favorite activities. He has now learned all of the asdf row, and is working on the row of letters right above it. 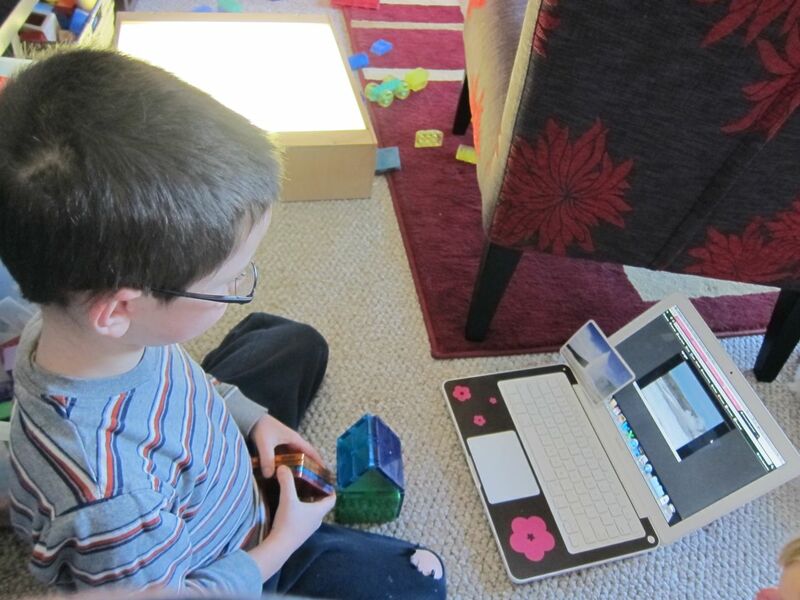 Almost all week, Jedi asked for extra typing time because he really enjoys the program he’s using! History–In Ancient History, we continued our work on Ancient Egypt. Jedi learned about pharaohs and mummies, and began learning about Egyptian Mythology. He really enjoyed the myth on why the Nile River floods yearly! He also mapped Ancient Egypt, including the Nile River, Nile River Delta, & Upper/Lower Egypt. Ohio History–This week’s Ohio History lesson was more like “Ohio Geography”. Since the other neighboring midwest states play a big role in Ohio’s history, Jedi worked on mapping all of the midwest states. Geography –In Geography, we completed our unit on South Africa. 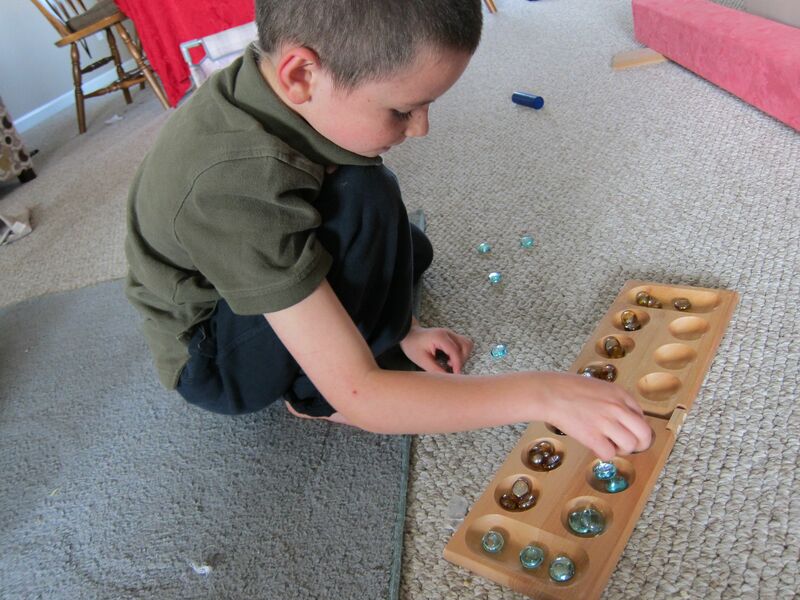 Jedi learned to play mancala, a game played almost everywhere in Africa. He also learned about South African animals. At the end of the week, all of the kids helped to prepare a South African meal for dinner–bobotie, yellow rice, & mealiebrood! Doing a little extra work this week... 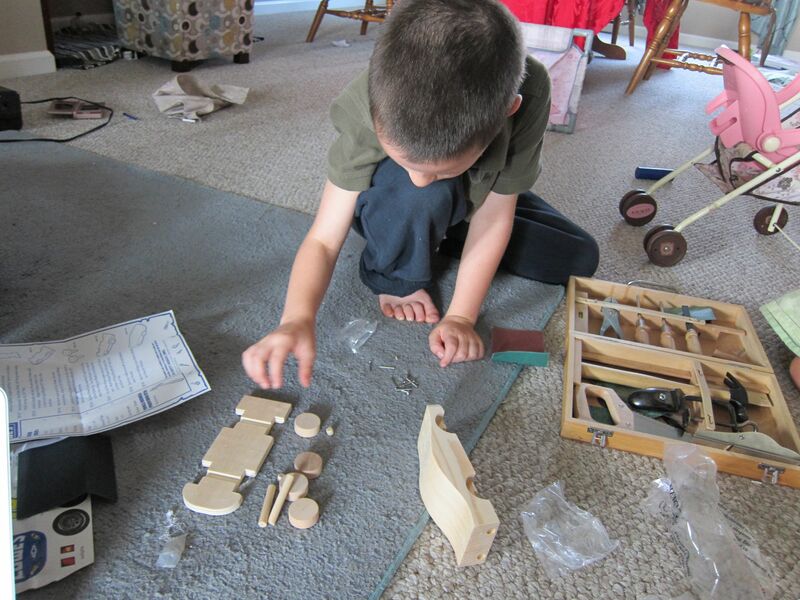 He was practicing his woodworking skills to build a car. Life Science: This week’s life science theme was the 5 senses. The first lab, Jedi studied touch and sight, while trying to determine if you can train your senses to respond more quickly to a stimulus. To do this, I held a ruler about an inch above his hand. As I dropped it, we recorded the number of inches the ruler fell before Jedi caught it. Now, this was a bit tough for him because autism keeps him from having the quickest reflexes and a high level of eye hand coordination. But after about 10 trials, he was able to improve slightly, from allowing the ruler to fall 10 cm to allowing the ruler to fall only 6 cm. For the second lab, I set up a station for touch, smell, sight, taste, and hear. With the exception of sight, all of the stations were closed in a container that couldn’t be peaked at, while Jedi was blindfolded. At each station, he had to try to guess the object using only the sense being isolated. The point of the lab was for Jedi to determine which sense he trusted the most, and which one was most reliable…for him, sight won on both accords. Jedi testing out his five senses to find out which one was most accurate. Earth Science: This week in earth science, we learned about the water cycle (how the water that is on the earth today is the same water that has been on the earth since the dinosaurs, and how the water goes from ground to air to cloud and back to the ground). We also learned about the states of water (solid–ice, liquid–water, and gas–vapor or humidity). 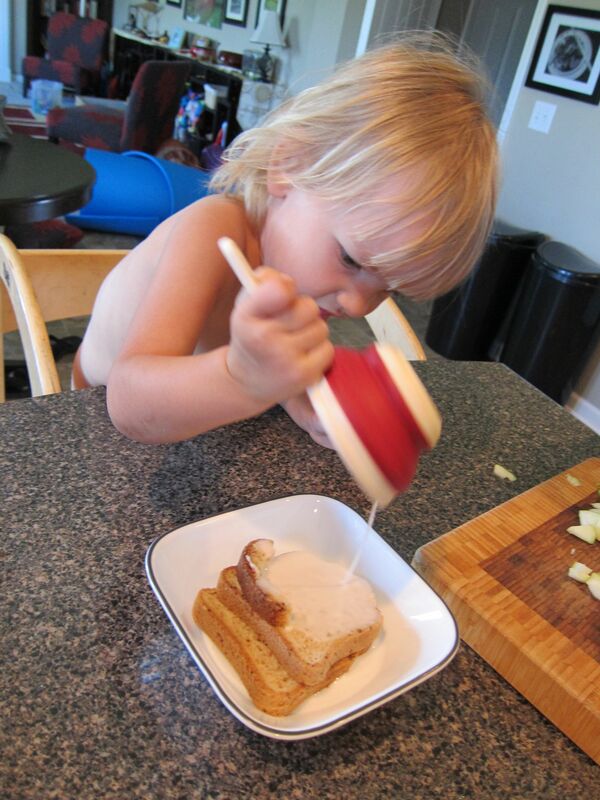 To do this, Jedi observed ice, room temperature water, and then the steam that rose from boiling water. To create condensation, he then cooled the steam (by putting a cookie sheet of ice on top of the boiling pot of water, and then again by filling a glass with ice water). Jedi learning about the water cycle and solid/liquid/gas/condensation/evaporation by using ice cubes, water, and the stove. Math: In math, Jedi was learning how add numbers to equal multiples of 5. He was supposed to add mentally, but he had a lot of difficulty with that. 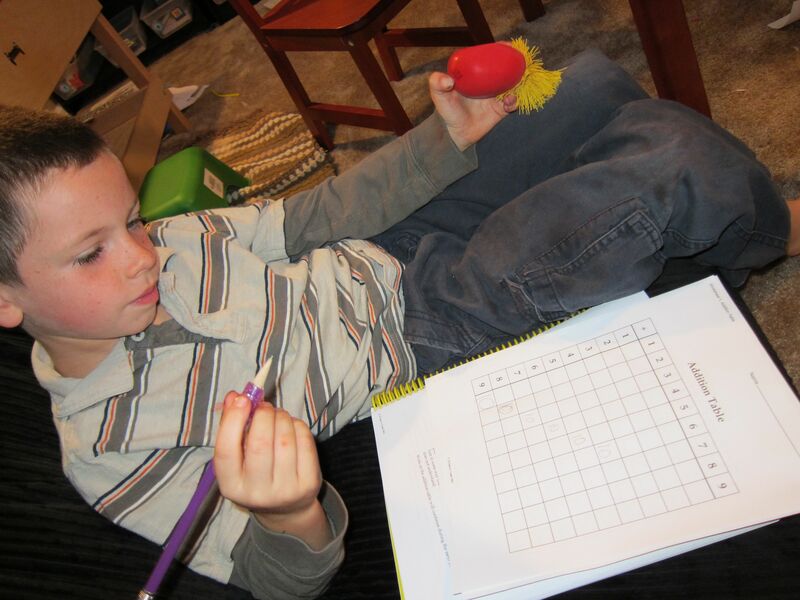 Using the abacus, he was able to do it a little more easily, but still needs to practice some more on that concept. Using the corner cards (cards with 1 number on each side). 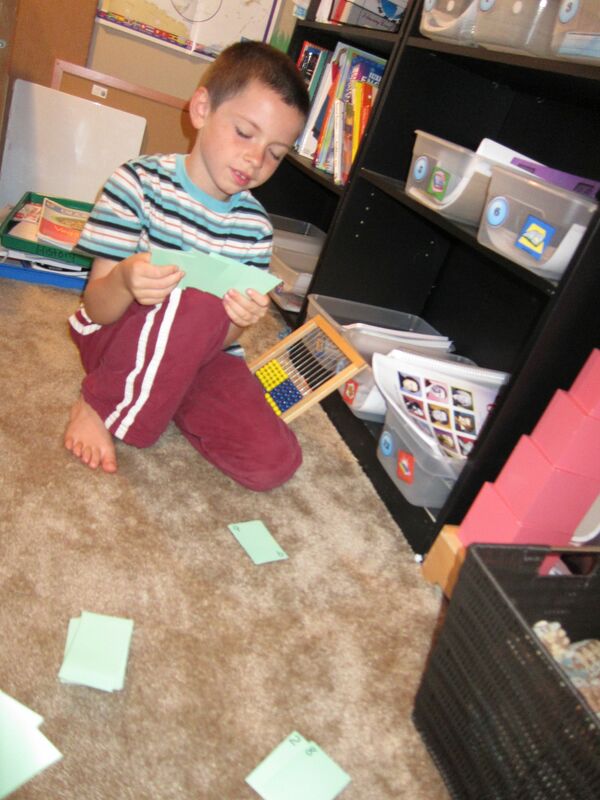 He had to put cards together so that any numbers that touched equaled 5, 10, or 15. What it looked like after Jedi finished his pile of cards. Handwriting: This week, I pulled out two books on journal prompts for Jedi. Since he has so much trouble with handwriting and spelling, I want him to have short bursts of writing to practice with so that he at least can practice getting ideas on paper, without having to worry about making it “publishing quality”. One book he works with daily and each day gives two choices for journaling–I have him pick whichever one sounds most interesting to him. 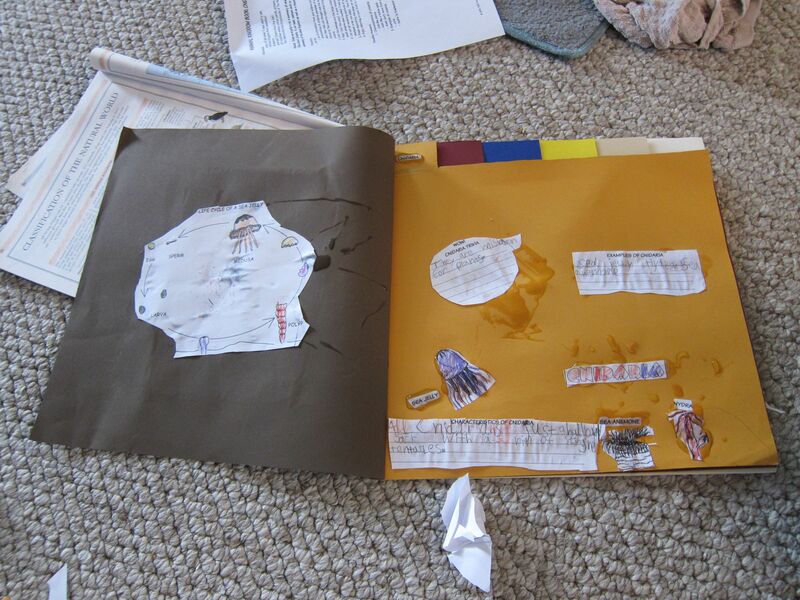 The other book has a short sketch that he can do on a particular fantasy/fiction topic, and then a space for him to write one or two sentences describing his sketch. Working on his journal prompt about a funny dream. 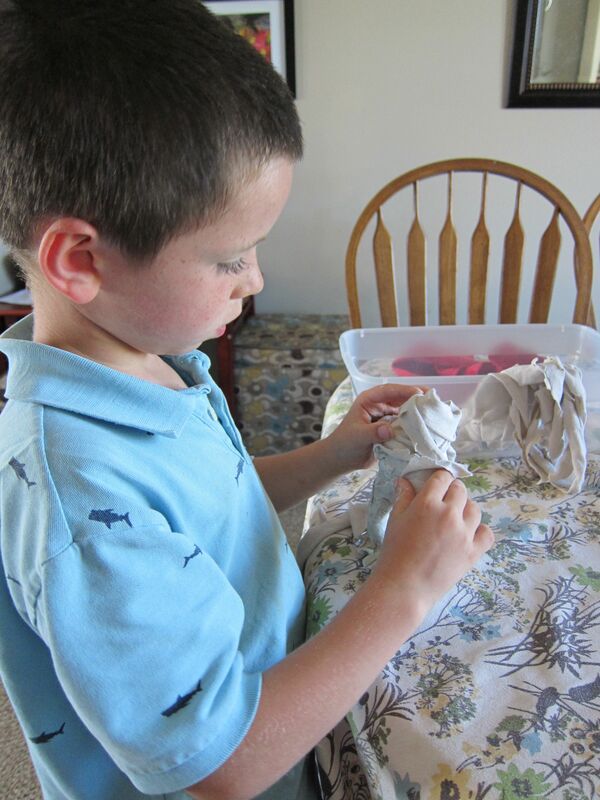 Art: This week in art, Jedi continued his lessons on an object’s shape and form. With a charcoal pencil, he sketched the contours of his toy snake, filling in accents using only straight lines. He also worked on color blending. 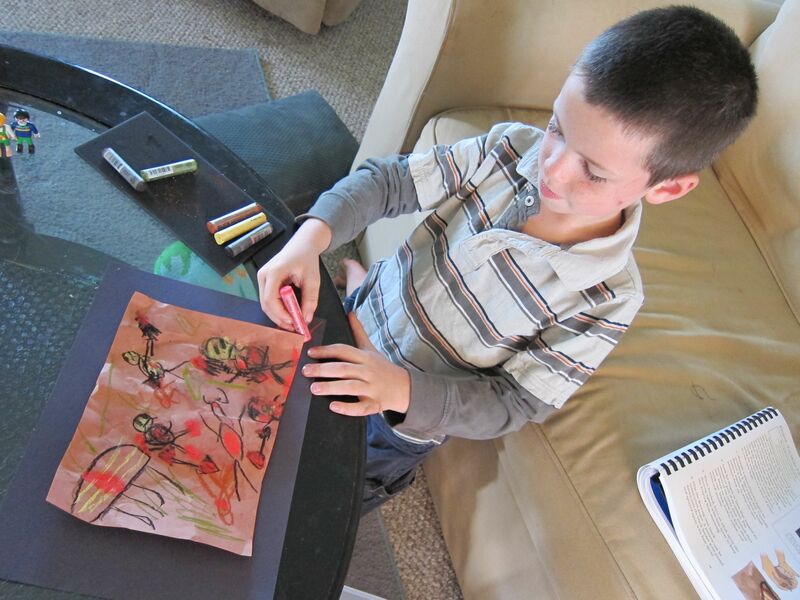 Using red, yellow, and blue watercolor crayons, I had him draw whatever he wanted to…the only rules were he could only use those three crayons, and for every other color, he needed to create it through blending two or more of the three crayons he had. Using watercolor crayons to work on color blending. He was only allowed to use red, blue, or yellow crayons for this. Using charcoal pencils to sketch the contours of his snake. History: In history, we worked on Ancient Egyptian hieroglyphics and learned about the first writings from Ancient Sumer and Ancient Egypt. 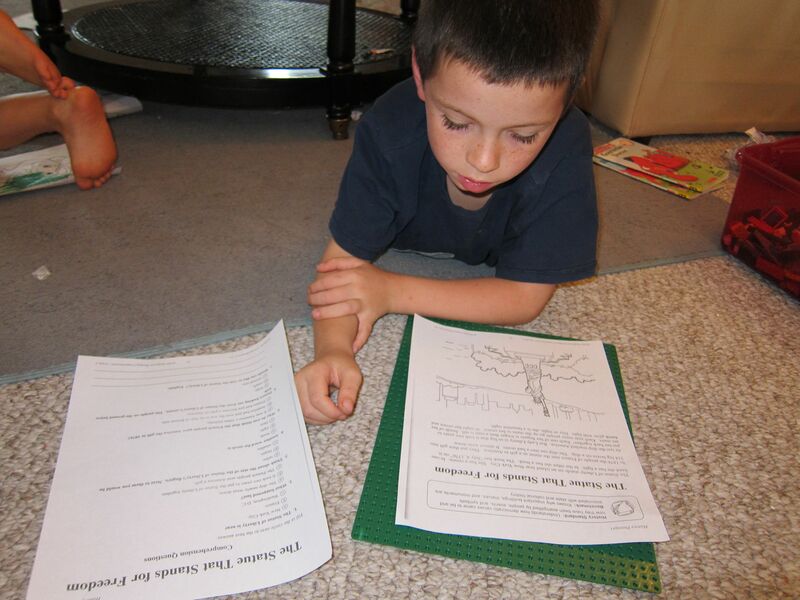 He learned about papyrus (and then we were able to observe it’s relative, the nutsedge, in our own yard!). He then learned to write and decode messages in hieroglyphics. Geography: In Geography, we started on our 2 week unit on South Africa. We learned about life in South Africa, including the form of government, main languages & religions, how to say ‘hello’ in one of the South African dialects, and what type of currency is common there. We also started learning about the animals & musical instruments used in South Africa, and listened to a South African children’s nursery rhyme. English & Spelling: In spelling, Jedi finished up learning about the short vowel sounds, and also started learning about ‘consonant teams’ (two consonants that are together and form a sound, such as ch, sh, and th). In English, we learned about nouns & verbs, as well as putting the events of a story in order.